Smartphone photography has been lacking some important features – that is, until now. 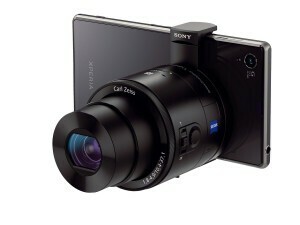 With Sony’s release of their QX Series “Lens Style Cameras” the camera-phone concept reaches new turf. The two features I miss most when shooting with my Samsung Galaxy or my iPad are depth of field control and real optical zoom. Both are now possible with this fantastic add-on. This concept replaces the traditional camera’s body with your mobile device giving you the potential of a really massive view screen. Imagine a point and shoot with 10″ LCD and you get the idea. 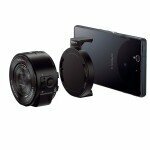 These lens-style cameras are compatible with any iOS or Android device that will run Sony’s app and can connect via wi-fi or NFC one-touch. Because the camera contains it’s own password protected wi-fi hotspot, no separate wi-fi network is required. The camera does not need to be attached to your mobile device to operate. The camera does not need to be attached physically to your device so it can be controlled remotely. A feature that could come in handy for photographers looking for a remote camera with live view and wireless tethering features. Sony claims the maximum wireless distance varies depending on the phone or tablet and local conditions. Candid street photographers will appreciate the camera’s built-in shutter release and MicroSD memory card that allow for un-tethered shooting. Keep your phone on and the app running and every shot will automatically backed-up with a 2MP file to your phone for fast social sharing or uploading to flickr (or our weekly facebook photo theme and contests). While the idea of syncing your pocket camera to your mobile device is not new, Sony’s approach to the mating the two is. What I really love about this approach is the convenience of reduced bulk by no longer carrying both a phone and a full pocket camera. The two can become one when it’s ideal and can separate whenever you like. The Premium Cyber-shot DSC-QX100 ($500 MSRP)weighs 6.3oz complete and is equipped with a 1.0 inch, 20.2 MP Exmor® RCMOS sensor. The same sensor used in their Cyber-shot RX100 II camera. This ultra-low noise sensor is suitable for low-light night shooting. If that’s not enough, Sony added a wide-aperture (f/1.8 – f/4.9) Carl Zeiss® Vario-Sonnar T* lens with 3.6x optical zoom (28mm to 100mm @35mm equivelent) with a dedicated control ring for adjustment of manual focus and zoom – just like the big boy cameras. The DSC-QX100 includes several shooting modes including Program Auto, Aperture Priority, Intelligent Auto and Superior Auto, which automatically recognizes 33 different shooting conditions and adjusts camera settings to suit and will shoot full HD video at a smooth 30 frames per second with audio. High-Zoom Cyber-shot QX10 ($250 MSRP) includes 18MP 1/2.3 Exmor RCMOS sensor and 10x optical zoom – made possible by the smaller format sensor – and a Sony G Lens. the QX10 weighs in at less than 4 oz and measuring about 2.5”X2.5”x1.3”. Additionally, the camera has built-in optical image stabilization, has Program Auto, Intelligent Auto and Superior Auto modes to choose from, and will be available in two different colors – black and white.